Just yesterday, AMD launched their brand new Radeon R9 Fury X flagship graphic card. And within 24 hours of launch every single SKU on the market is sold out. All the big etailers including Amazon and Newegg are currently going through the restocking phase with cards listed as ‘Out of Stock’. This is both very promising and could be potentially alarming for the product at the same time. The sell out indicates an absolutely killer demand for the card while the 24 hour time period indicates a rather limited initial quantity of cards (available to the etailer). It would appear that AMD’s forecasts have been exceeded again. 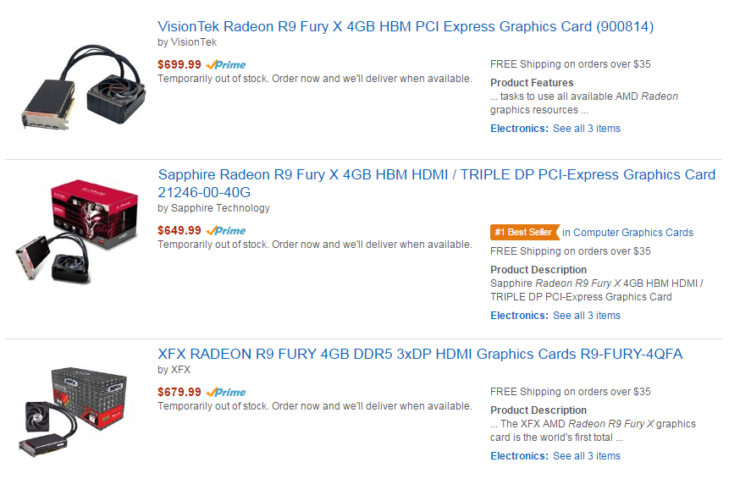 Because the Radeon R9 Fury X is selling like hot cakes. All the major online retailers are listing the card as sold out. You can check out Amazon and Newegg for yourself here or take a look at the various screenshots below. 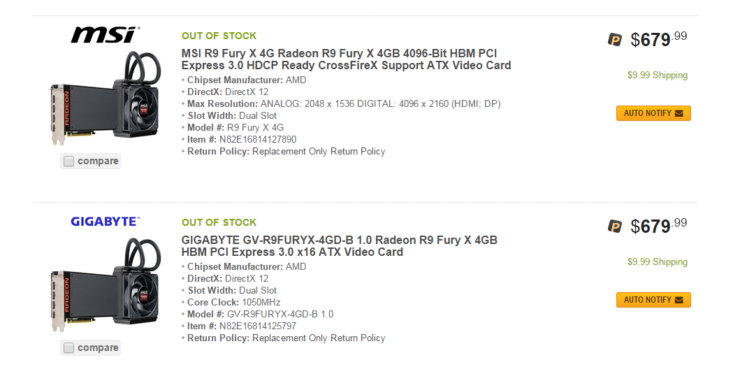 If you are a prospective Fury X buyer and find the card listed somewhere, still in stock, consider yourself very lucky. 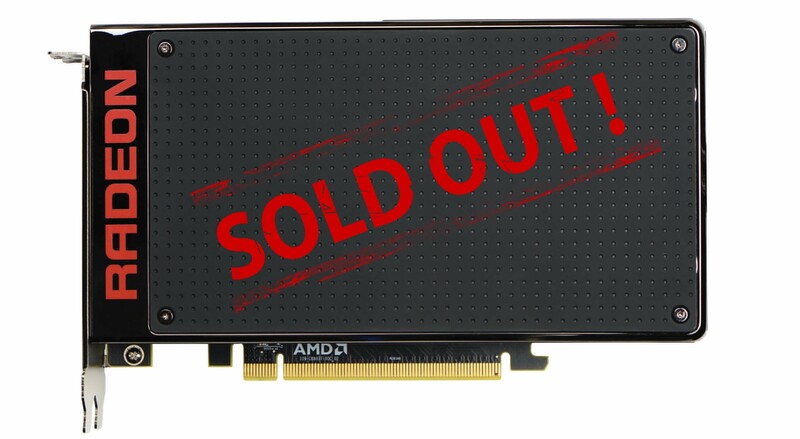 Ofcourse, the sell out was to be expected considering the Fury X’s enormous value but so short a time period indicates that either the supply chain’s forecasts were exceeded or there is an initially limited quantity of GPUs to go around. Considering the hype of the card, I would think the former being very unlikely. So far the pricing remains around $649 or so, but if the quantity available to the etailers continues to be shallow in the future, they will start to mark up the prices to effectively use the high demand. AMD would be helpless in regulating prices if it comes to that. 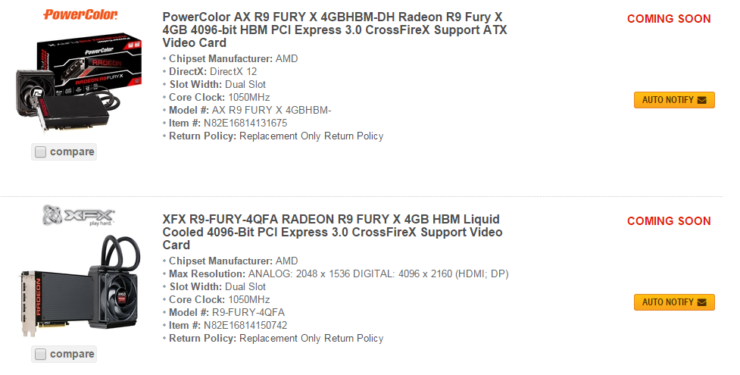 As long as buyers are willing to buy the R9 Fury X at a higher price, etailers will continue to sell them. 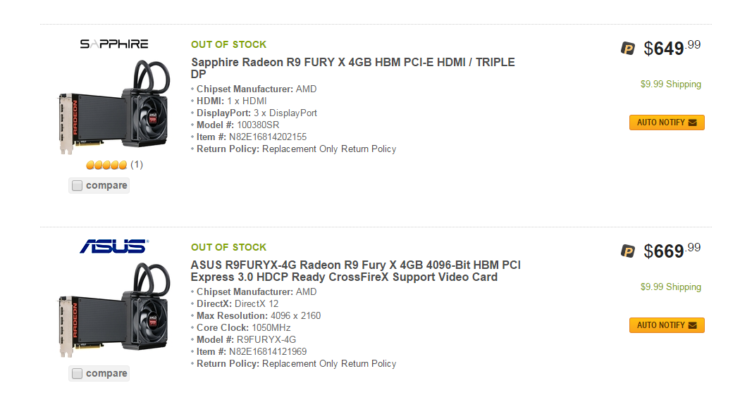 Most of the retailers online will be restocking shortly and they should have a very fair idea of what kind of demand exists for the Fury X. If it still continues to be out of stock within short durations of time, they themselves will have little choice but to markup prices. I would be keeping a lookout on Fury pricing since this entire affair is a lesson in supply and demand economics, and another bout of bitcoin-litecoin-like conditions, while good for the company, will not be good for the gamers and the average consumer.